In a welcome move earlier this week, UK PM Theresa May announced snap general elections on 8 June 2017- a full 3 years earlier than the original 2020 polls. On the face of it, this decision was taken to rally the parliament behind the complicated Brexit talks. The June polls would see a new government in place just before the round of talks scheduled later this year to finalise the messy divorce with the European Union after the shock 2016 Brexit vote. For the pacifists around the world this brings forward favourable prospects of a Corbyn-led Labour government- a flicker of light in an era of Trump’s darkness. Since the fateful Atlantic Charter signed between Churchill and Roosevelt in 1941 aboard HMS Prince of Wales, the U.K. has long been the most allied of allies and a junior partner to the US. Together the two nations have launched unilateral wars and regime changes in the Middle East, Latin America and Africa since World War 2. Very few people are aware of the clandestine coup that the two allies brought in Persian gulf that essentially paved the way for war, famine and destruction in our part of the world Long before the more famous Afghan Jehad wars. The documents declassified under freedom of information laws, describe in detail how the US – with British help – engineered the coup, codenamed TPAJAX by the CIA and Operation Boot by Britain’s MI6. This western intervention in a sovereign nation was done to protect western oil interests in Iran by installing a puppet Monarchy. This became the classic modus operandi for western allies who wished to protect their strategic resources in blatant disregard to international law and national sovereignty of countries. The UN quickly became a rubber stamp for these unilateral acts of aggression. In Iran, people eventually rose up that would later see the puritans leverage the situation to their advantage in installing a religious regime. Ultimately in a zero sum game the Ayatullahs really hurt the Persian heritage of tolerance and Sufism founded on the poetry of Hafiz, Rufi and Jami. To imagine that it was all started for petrodollars makes mockery of human rights slogans of the west. This Persian coup, together with the installation of the House of Saud in the Arabian Peninsula by MI6 British agent Lawerence of Arabia brought together the unholy nexus of war, oil and construction economy that has ever since intervened in Iraq, Afghanistan, Libya and now Syria. With Theresa May’s announcement of snap polls, for the first time in decades , there appears from among this theatre of war in an era of mutually assured destruction (MAD) , a silver lining in the form of Jeremy Corbyn, the first anti-war leader of a major political party in the entire western world. Given Trumps penchant for war as demonstrated by Syrian strikes conducted over cake & biscuits, the need for Corbyn’s pacifism suddenly brings a ray of hope – a possibility of a more just global order. Widely considered an outsider to the power corridors, Jeremy Corbyn’s rise to the mantle of Labour Party in 2015 is a story of rare determination. Within a year of his rise, his own party rebelled against him, forcing Corbyn to seek re election to the leadership. However, the labour voters – disenchanted with Blair-Brown-Miliband troika of putting themselves before the socialist ideals of the Labour Party – came out in an even stronger numbers to give Corbyn a comfortable majority. 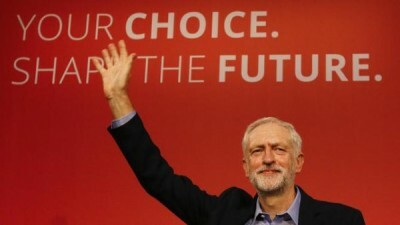 During his parliamentary career stretching over 32 years, Mr Corbyn has been the most uncompromising MP in the Commons – defying party orders more than 500 times, marching with rival parties against the Labour government and even calling for an uprising against British troops over its excesses overseas. He is famous for splitting with his second wife following a row over their son’s education – Corbyn wanted public schooling for his son to set a precedence for other parliamentarians. He began his career rallying for the anti-apartheid movement and was even jailed several times. But it is his anti war stance that speaks volumes of his courage and determination. During the wag the dog years of Blair-led Labour government, Corbyn went against his own party and voted against Iraq intervention. This anti apartheid veteran had the experience of injustice, war and racism in the latter half of the 20th century. One hopes the British people will seize the opportunity to redeem themselves. For centuries their country was involved in colonialisation and intervention in sovereign government since the wild Wild West days of the East India company. The world deserves better , the world deserves Corbyn.